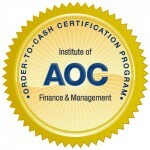 What is the IOFM Order-to-Cash Certification Program? IOFM’s O2C Certification program is designed to equip sales, credit, billing, AR and collection leaders and their staff to think end-to-end, to analyze, understand and redesign their current processes, and to introduce and manage change. Is O2C Certification right for you? Whether you want to support your organization’s evolution towards establishing a collaborative and integrated order-to-cash process, or you are already well on your way to a harmonized end-to-end O2C process, this training will give you and your team the resources and knowledge you need to become a leader in your organization’s advancement toward achieving a truly effective end-to-end process.